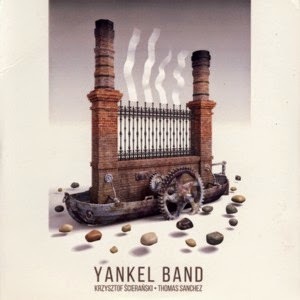 This is a live recording by the Polish ensemble called Yankel Band, which hails from the town of Lodz and plays mostly original instrumental music. The ensemble is a quartet and comprises of violinist Piotr Przybył, guitarists Krzysztof Kociszewski and Bogdan Grad and accordionist Maksymilian Pelczarski. For the concert captured on this DVD the band was expanded to a sextet with the inclusion of the Polish Jazz bass legend Krzysztof Ścierański and Mexican (resident in Poland) percussionist Thomas Celiz Sanchez. The sextet performs five compositions, four of which are originals composed by Przybyl and Kociszewski (two each) and the remaining one is a Yiddish standard. Contrary to the band's name, which suggests an association with Jewish Music and Culture, the ensemble presents an amalgam of Jazz and World-Music influences, mostly of Gypsy and other European folkloristic sources, but not connected to Jewish music per se. The inclusion of the Yiddish standard seems a bit out of place, as if used only to justify the band's name? All the musicians involved in this project are highly professional players with extensive experience, and they manage to create an intimate almost acoustic ambience, cooperating with each other splendidly. The tunes receive expanded arrangements, stretched out to allow elaborate solo parts by all the participants. Many of these solos are truly excellent, musically coherent and even bordering on virtuosity. Scieranski is still in excellent shape and still leaves most other Polish electric bassist way behind. However, the band fails to present a truly original voice overall, and sounds like numerous other ensembles playing similar material in Poland, not mentioning the World over. Nevertheless the concert is definitely worthy of the attention of fans of improvised melodic World Music, and should be enjoyed by most listeners. As to the video component of this DVD, it is honestly rather unexciting. Watching six musicians standing in a circle and exchanging licks is as interesting visually as licking ice. Releasing this material in audio form would have been more than enough. But of course that is not my call… Enjoy!